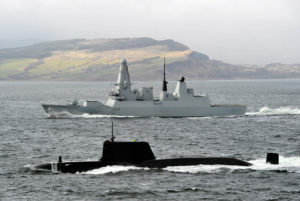 GMB Speaks up for High Skilled Defence Jobs At TUC. Motion P17 was agreed yesterday afternoon, calls for the TUC, and unions with thousands of members employed in the defence sector, to campaign for a Shadow Defence Diversification Agency whose key aim would be to ask trade unionists to come up with ideas for replacing their own jobs with something else. GMB and one other union (Prospect) voted against the motion, but unfortunately passed with the support of Unite. Congress welcomes the ‘Lucas Plan’ 40th Anniversary Conference held in Birmingham in November 2016 and agrees that the Plan was an idea from which we can learn much today. The Plan was a pioneering effort by workers at arms company Lucas Aerospace to retain jobs by proposing alternative, socially useful applications of the company’s technology and their own skills. Forty years afterwards, we are facing a convergence of crises – militarism and nuclear weapons, climate chaos, and the destruction of jobs by automation – which mean that we have to start thinking about technology as political, as the Lucas Aerospace workers did. However, in the four decades since the Plan was drawn up Britain’s manufacturing industry has shrunk from 25 per cent to 14 per cent of GDP, with the ‘defence’ industry now representing 10 per cent of all manufacturing. Britain cannot afford to lose any more manufacturing skills and capacity, and ‘defence’ workers are rightly concerned about the potential loss of jobs, for example if Trident replacement is cancelled.In line with the outcomes of the Lucas Plan Conference, Congress therefore calls on trade unions and the TUC to lobby the Labour Party to establish before the next general election a ‘shadow’ Defence Diversification Agency, to work closely with the Shadow Department for Industry in developing an overall national industrial strategy including the possibility of conversion of ‘defence’ capacity. The first task of this Agency would be to engage with plant representatives, trades unions representing workers in the ‘defence’ industry, and local authorities, to discuss their needs and capacities, and to listen to their ideas, so that practical plans can be drawn up for arms conversion while protecting skilled employment and pay levels. A key means for developing the national industrial strategy would be the National Investment Bank proposed by the Shadow Chancellor. Congress also urges trades union councils, trade unions and the General Council of the TUC to assist ?work of such a ‘shadow’ Agency if set up?. President, Congress, Justin Bowden, GMB speaking against motion 17. Congress, one of the consequences of this motion would be to take away from thousands of workers the certainty of good, unionised jobs that give them and their communities prosperity and economic security. The motion fails to address the issue of appropriate defence strategies to protect the security and safety of a nation of more than 65 million people in a very uncertain world. Britain is an island nation, nowhere near self-sufficient in either food or energy. The security of the nation, and the well-being of its citizens, requires strong armed forces equipped with the latest weapons, to keep the sea lanes open and deter threats. Parliament has already voted to renew Trident; 14 months ago it was passed by a majority of 355. Labour’s superb manifesto at the general election was explicit, ‘Labour supports the renewal of the Trident nuclear deterrent’; and the Party kept hold of seats on the back of that commitment. This motion undermines Trident and the conventional defence industry through the back door – an industry employing over 250,000 workers and 4,300 apprentices – where average pay is £39,000, some 44% above the national average. Exactly the sort of well-paid, highly skilled jobs everyone of us in this hall works to achieve and protect. The motion calls for the TUC, and Unions like GMB with thousands of members employed in the defence sector, to campaign for an Agency whose key aim would be to ask Trade Unionists to come up with ideas for replacing their own jobs – akin to asking them to become the proverbial turkeys voting for Christmas. GMB already listens to our members in the defence industries. We know GMB members take pride in their work and their skills, we know they are proud of the contribution they make to their industries, the economy and yes – the defence of their country. Congress, The Lucas Plan was about saving jobs in the face of company redundancies, this motion risks encouraging redundancies……..The logical conclusion would be to actually fuel the decline in manufacturing jobs the motion is supposed to prevent. Our members in defence would vote with their feet. GMB cannot support a motion replacing real, well-paid, Unionised jobs with uncertainty, insecurity and decline. GMB members in the shipbuilding industry and the defence sector are as vital to our security as the RAF’s pilots or the Navy’s sailors. Congress, posturing on unilateral disarmament and neutrality undermines the security of our fellow citizens as well as undermining the jobs and communities of our members. GMB will never support such proposals. Please oppose motion 17. Thank you. Personally, I cannot express how disappointed I am with unites lack of support of its members in our industry.